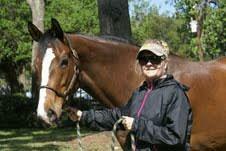 “I really felt like I wanted to bring the old guys home,” said Stephanie Brennan about starting her Thoroughbred retirement charity, Final Furlong, based in Ocala, Fla. Final Furlong provides a segue for retiring Thoroughbred racehorses to be safely rehabilitated and repurposed. The program targets at risk horses and owners/trainers who will ultimately face the need to re-home a horse at the end of its career. Emphasis is placed on a specific rehabilitative period and placing the horse in the most suitable second career. The average mandatory stay of an enrolled horse is 90 days, during which general veterinary, hoof care, and specific rehabilitation needs are addressed. One of the unique aspects of the organization is Brennan, and her team of volunteers, actively look for horses steadily dropping in the claiming ranks. “When they start running at a low level, we contact the trainer,” said Brennan about acquiring new horses for the program. Since the organization runs on donations and volunteers, Final Furlong asks for a small donation for each horse accepted into the program. TCA’s grant funds assisted with one of these new cases last year. Gunpowder Creek’s racing career was winding down and Brennan decided to put together a syndicate of sorts to purchase the horse. However, the day the collection was to start, is the day a check from TCA came in the mail. Gunpowder Creek required quite a bit of rehabilitation (90 days stall rest, 30 days hand walking and 30 days in the round pen), but once cleared by the vet, he was quickly adopted and transitioned into a dressage horse. Although the TCA’s grant funds brought Gunpowder Creek to Final Furlong, Brennan cites boarding the horses is their most expensive cost. Luckily, most horses in the program are quickly adopted once they have completed rehabilitation, but four Thoroughbreds are lifetime retirees at Final Furlong. Brennan’s greatest success in the program is receiving photos of Final Furlong graduates in their new careers. “Whether it is an upper level event horse, or an 8-year-old child riding on a trail horse, I love seeing the horses in their new careers,” said Brennan.